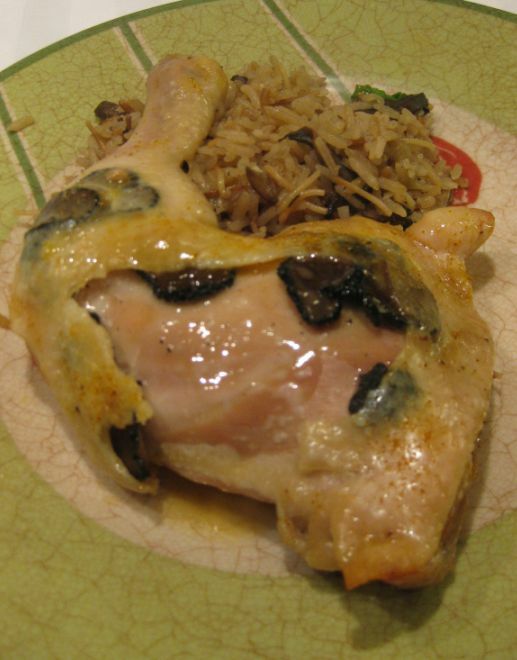 Poulet demi-deuil means chicken in half mourning, probably because of the black robe of truffles under its skin. Funny way of naming a dish but it is a delicious mourning dish! Very easy to make and very delicious! 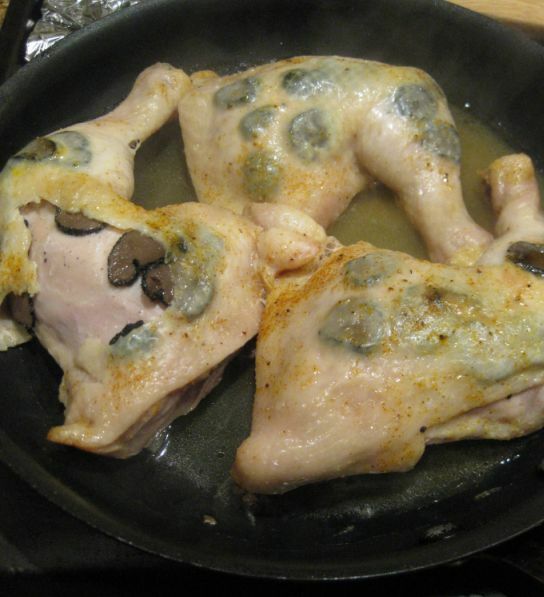 This is one of this dish that the chicken cost only a few bucks and the truffles cost at least 10 times more than the chicken. 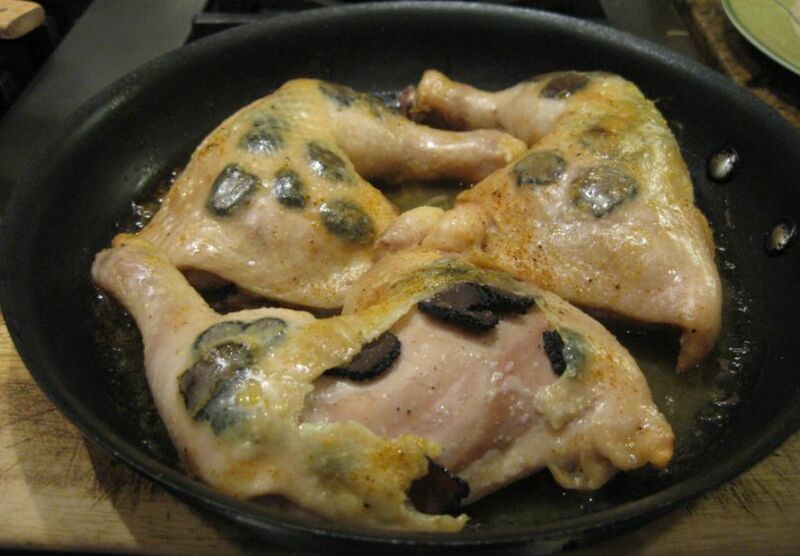 This is a rustic dish, so serve it as it is coming out of the oven, no need to put the chicken on a plate. Close look at the dish. The flavor of the truffles was so good. I told Kevin that this is a fancy dish to serve on a week day and his response was: "Mom, this is the norm for me.". Truffles as the norm? I don't think so! Take your knife and gently pry the skin without tearing it. 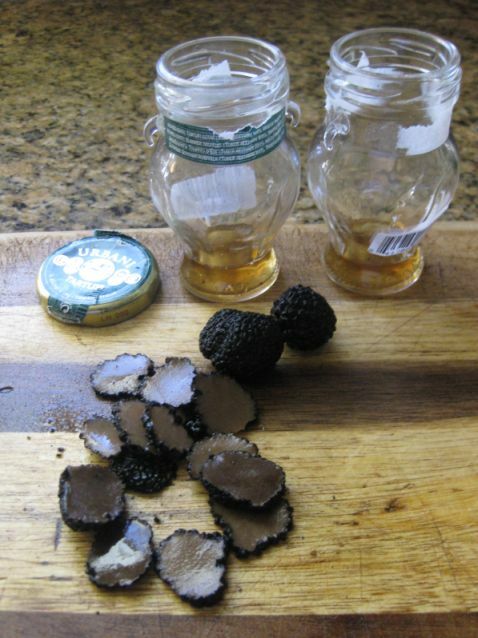 Slip the truffle slices under the skin in a single layer, covering as much flesh as possible. 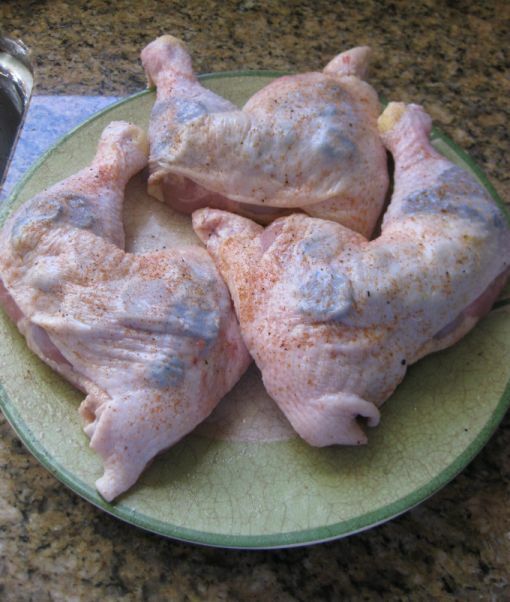 Next, rub the chicken with salt and pepper. Refrigerate for overnight. 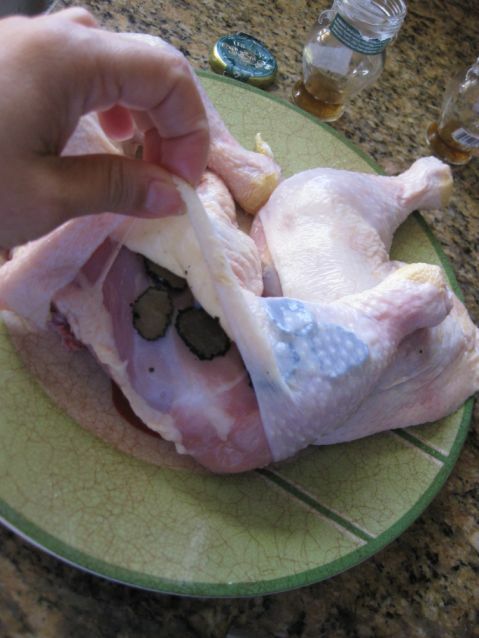 The next day, rub the chicken with butter. Rub the inside of a small pan with garlic and remaining butter. 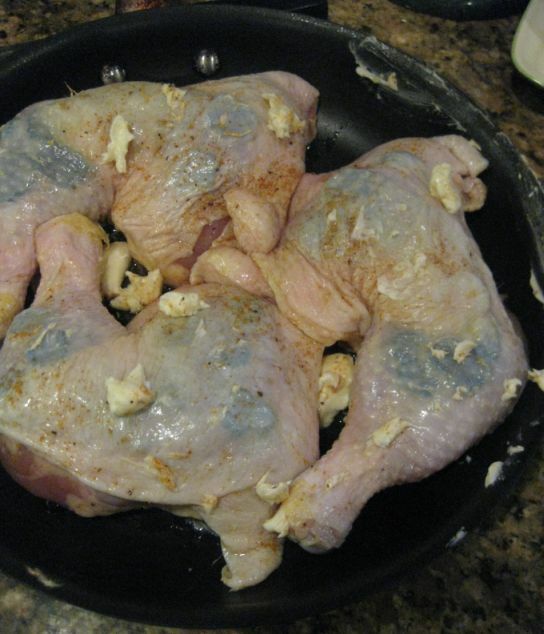 The pan should be tight fitting and be just a little bigger than the chicken. 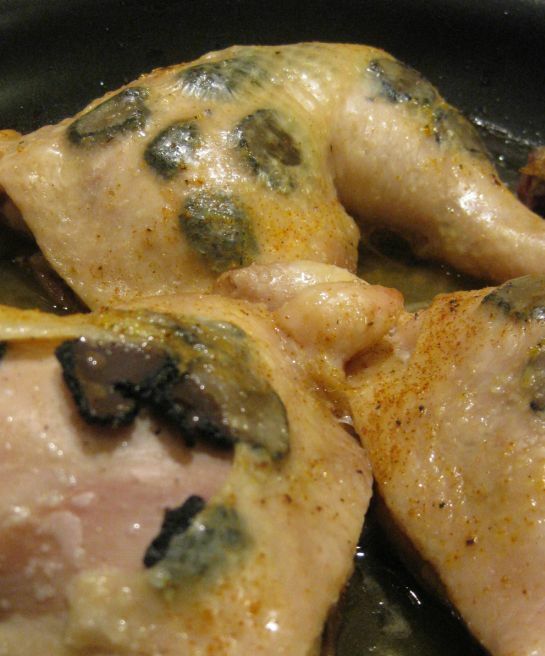 Pour Madeira an cognac around the chicken in the pan. Tightly cover and bake for about 40 minutes in a pre-heated oven at 400 degree. Lift the cover at the table so allow everyone to enjoy the fragrant steam. Serve with egg noodles and good crusty bread if you like.